The tricks of Halloween may have been and gone for another year, but pumpkin-based foods are still very much a treat to enjoy through this season. I was intrigued to cook pumpkin as I’d never even carved one, let alone cooked it. As a fellow squash plant, it’s very similar to preparing a butternut squash, but thankfully, slightly less labour intensive. Soup is definitely back in vogue on these increasingly chilly, autumnal days. 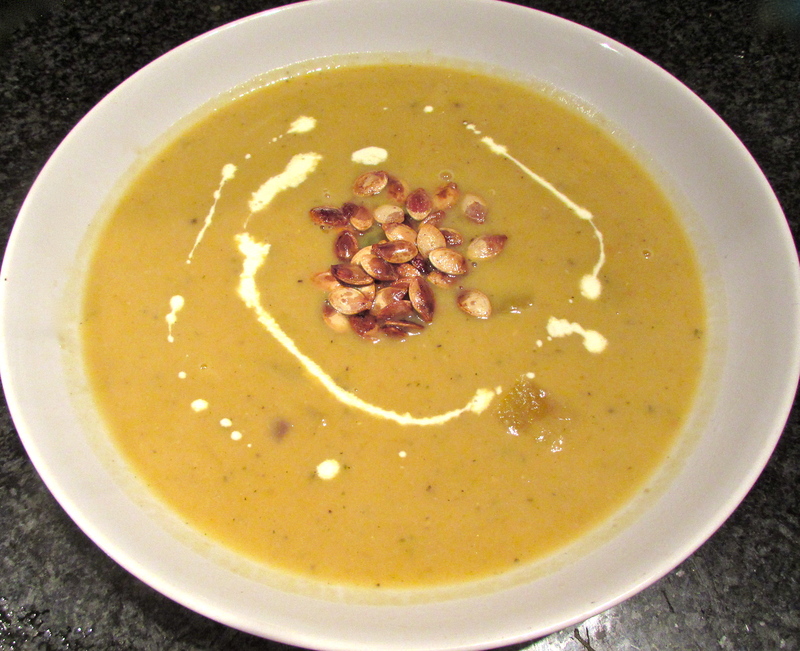 This pumpkin soup dish is a slightly richer variation of a BBC Good Food recipe, using cream instead of creme fraiche. It’s sweet and herby and the toasted pumpkin seeds make for an innovative garnish adding a crunchy texture and salty flavour. Heat 1 tbsp of olive oil in a large saucepan. Add the onions and cook for five minutes or so, until soft. Stir in the garlic, chopped pumpkin and lentils and sprinkle the thyme over the ingredients. Pour in the hot stock and stir, making sure all of the ingredients are well covered. Season, cover and simmer for 20-25 mins until the lentils have expanded and the pumpkin has softened. Meanwhile, wash the pumpkin seeds. Remove any flesh still clinging to them, then dry them with kitchen roll. Heat the remaining half tbsp of oil in a small frying pan and toast the seeds for five to ten minutes, or until they start to turn a warm golden colour. Take them off the heat and place them on a couple of sheets of kitchen roll. Sprinkle over the salt and sugar. When the pumpking mixture is ready, take the pan off the heat and pour into a large bowl. Whizz the cooked mixture with a hand blender until quite smooth (though I like to leave a few lumps of pumpkin in the mix). Pour in the cream and stir with a large spoon. Season to taste. Serve in large, shallow bowls, with the golden seeds as a garnish in the middle and drizzle over a little bit of cream if you have some left over. This warming pumpkin soup is perfect as a light evening meal served with crusty bread, or it can be prepared in advance and used for lunches.